Every so often you have to venture into the world of big box retailing, if for no other reason than to see which of your vendors is also selling to Target or Walmart. (If the product is exactly the same, this counts as a negative when considering a reorder.) But when the search for large plastic bins sent me into big box land yesterday, it gave me a chance to see how I felt when the check out procedure went wrong. I had just unloaded my cart’s contents onto the conveyor belt when the clerk’s computer went down. She apologized and invited me to reload the cart and proceed to another station. Before I got there, however, someone else got into the line ahead of me. The clerk did not say anything. After she finished checking me out (delayed by the new chip card readers that are going to cause havoc this holiday season), there was no additional apology for the delay — or an offer to load the bagged items into the cart. Of course our store’s checkout procedure doesn’t always goes smoothly, and we may not remember to say we’re sorry when it doesn’t. But before our independent shops get deluged with shoppers, it would be a good idea to test the efficiency of our checkout areas. The purchase transaction is often what a customer remembers when they exit the store, and you want to make a good impression. Do all staff members know how to handle transactions such as returns, gift cards, and discounts? Is there a system in place to get change as needed throughout the day, especially on weekends? Are your POS systems, credit card machines, cash registers and such all up to date? Do you have a good supply of cash register paper and ink — and does every employee know how to change them? Customers expect gifts to be boxed and/or bagged. How is your stock of these supplies, and do you have an efficient space and process for packaging? Sometimes at the holidays we offer a fancy gift bag instead of a box (you can buy them for about the same price), and ask if it’s OK if we put it in the bag with the item instead of packaging it. Are your return policies clear, and customer-friendly? A gift receipt that goes into the package is a service we are pleased to offer. If there is a line, do you have a way to acknowledge the customers who are waiting and let them know you’ll be with them soon? Have you tried to make a purchase at your store to try out the system yourself? This may turn up an inefficiency that could be corrected. 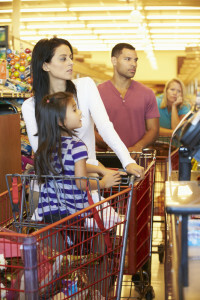 Keep in mind that time is as valuable as money to many shoppers, especially during this busy season. If you can keep the line moving quickly, and assure customers that they won’t have long to wait, you will be doing better than some of your bigger competitors. And don’t forget to say thank you when the transaction is done. The success (and future) of our businesses depends on satisfied customers who will tell their friends about their positive experience, and come back again themselves.